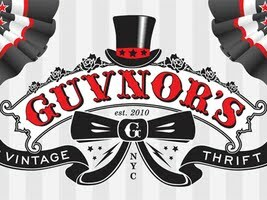 The newest Fifth Avenue vintage clothing store, Guvnor's Vintage Thrift, could be a boon to Brooklyn equestrians who are showing on a budget. I happened into the store this afternoon. Two old-fashioned baggy breeches caught my eye and got me digging in a rack where I found a couple pairs of gently used modern(!) breeches  one Ariat, size 22R. Then hubby noticed, hanging on both walls amidst a smorgasbord of boots, a dozen or so riding boots: field, dress and even one pair of hunt boots! Unfortunately, there were none in my size (9 with a narrow calf), but there were several in ladies sizes 6-8 and some mens. I know that many of the kids that volunteer and ride in city barns don't have deep-pocketed parents to support their horse habit, so if you're in the area, a trip to Guvnor's might be a way to get started or to stretch every dollar dedicated to participating in local shows.